AP TPT Exam Timetable 2018, AP HPT Exam Timetable 2018, AP TPT /HPT Exam dates ,AP LPT 2018 Exams Time Table, LPT 2017-18 Batch Exams 2018 Time Table, Pandit Training Annual Exams 2018 Time Table, HPT/TPT/UPT Annual Exams 2018 Schedule. AP School Education announced Language Pandit Training Telugu / Hindi Training Course Annual Examinations 2018 Schedule dates . These HPT /TPT Annual Exams will be held in the month of November 2018 examinations. 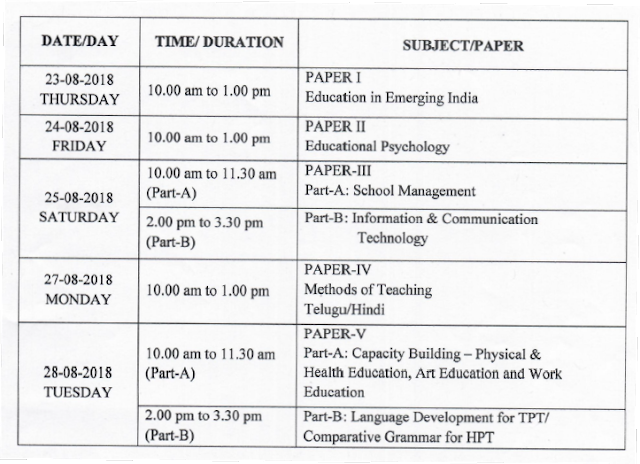 These examinations will be held from 10 am to 1.00 pm and the dates will be announced in November 2018 Part B Exams will be held from 2 pm to 3.30 pm. AP LPT Exams Time Table 2018 LPT 2017-18 Batch Exams Time Table 2018 HPT/ TPT Annual Exam Dates, Language Pandit Training Annual Exam Time Table 2018.